Chelsea’s Nemanja Matic, left, competes for the ball with Swansea City’s Ki Sung-Yueng during their English Premier League match in London on Sept. 13. UPDATE (Aug. 8, 10:14 a.m.): With the opening weekend of the Premier League upon us, we’re recycling this piece from September 2014 about England’s great football pyramid. There’s a whole lot more than just Chelsea and Arsenal. On Saturday, Swansea City will host Southampton in an English Premier League fixture in South Wales.1 Southampton was a founding member of the Premier League, having played at the top tier of English football since 1978 — football royalty. Swansea City, though, is a football Cinderella. Swansea City was founded in 1912 as Swansea Town. It hovered in the middling leagues of the English sport for much of the century. But in the 1960s, the team tumbled down the ranks, eventually requiring a financial rescue package and High Court approval just to survive. In 2001, it was sold — for a pound. But fortunes turned once again, for the better. It was promoted in 2005, 2008 and, finally, in 2011. The team had arrived. It was in the Premier League. The Premier League is the pinnacle of world football. Nearly 15 percent of the men who played in the 2014 World Cup play professionally in the Premier League, easily more than any other league in the world. Four English teams — Arsenal, Chelsea, Manchester United and Manchester City — have World Cup players numbering in the double digits. Importantly, unlike its analog in Giza, the Great Football Pyramid of England is not set in stone. The levels are linked through a process of promotion and relegation. Depending on the specific rules of a given tier, a number of teams that perform the best get to move up a level (promotion), and a number of teams that perform the worst have to move down a level (relegation). Each year, there is a minor upheaval of the hierarchy — a shifting of the pyramid. The romance, the beauty of this system is the following: Given strong enough performances and enough minor upheavals, in theory, any team can climb the ranks and, eventually, breathe the rarefied Premier League air. 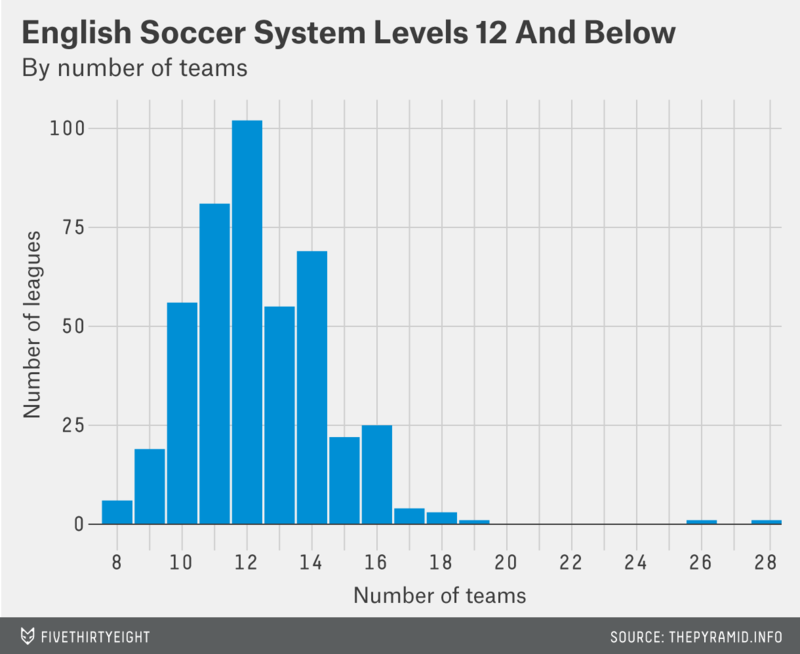 Let’s take a deep dive into — or, rather, a steep climb down the side of — the English football pyramid. On top of the pyramid — the capstone, Level 1 — is the Premier League. Twenty teams compose it. Some — Manchester United, Arsenal, Liverpool, Chelsea — are probably well-known to U.S. sports fans. A few — Hull City, Stoke City, West Bromwich Albion — probably are not. But all of these are competing for the most coveted award in English football: the Premier League title. Unlike most American sports, it’s the regular-season winner that matters here. There are no playoffs or championship series. 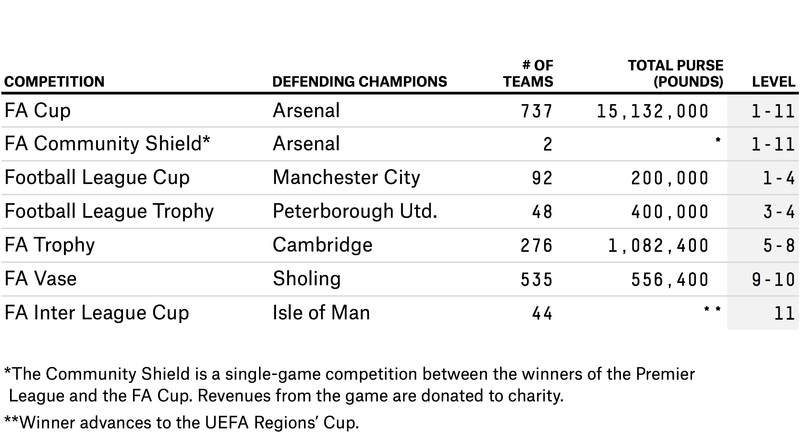 Also unlike most American sports, any team may be taking part in a number of competitions at once — the league, the FA Cup, the League Cup — but the one that really matters these days is the league title. As a result of the system of promotion and relegation, not every team has always had the pleasure of this competition. Like Swansea City, just about 10 years ago, Hull City was languishing. In 2003, the Tigers were members of the unglamorous fourth tier of the pyramid. But this team, too, climbed the summit. But, no rest for weary — Hull City are 5,000-to-1 dogs to win the title, and 9-2 to get relegated. Hull City will take on Newcastle United — four-time champions of England — this weekend. Within sight, but not quite within grasp, of the Premier League summit are the teams of the Football League. In fact, before the original Premier League teams essentially seceded in 1992, the Football League was the top league in England. Nowadays, the Football League encompasses Levels 2, 3 and 4 of the pyramid. Level 2, just beneath the Premiership, is the Football League Championship. Each year, 24 teams compete here for three coveted promotions to the Premier League. The top two finishers at the end of the season earn automatic promotion. The next four, the third- to sixth-place finishers, compete in a playoff for the final promotion. The secession of the Premier League by no means drained the Football League of its meaning. The consulting firm Deloitte has calculated that promotion to the Premier League is worth about $200 million in extra revenue for a Football League team. 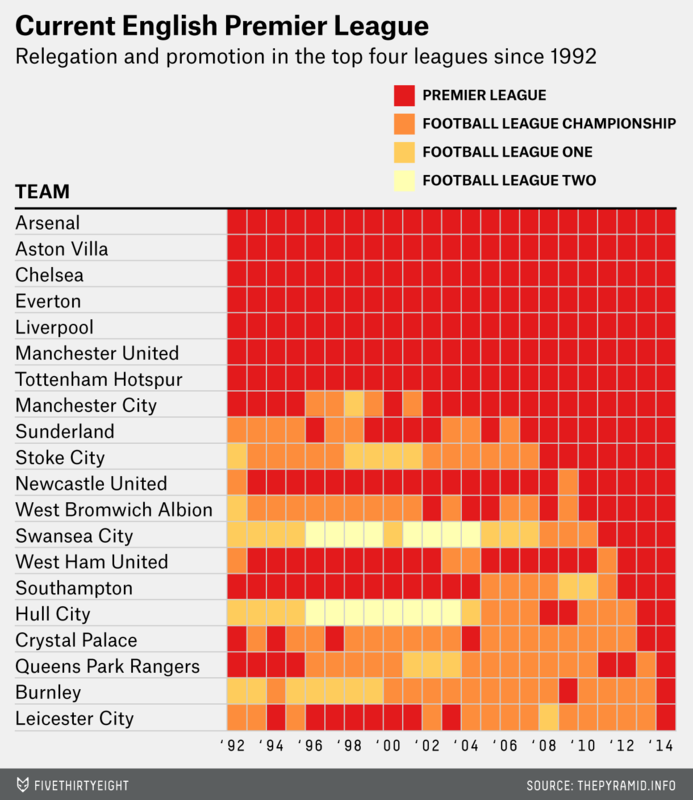 In some cases, the difference between promotion and relegation can come down to one game. And in some cases, in can come down to one minute. Often, the difference between a lengthy stint in the Football League and Premiership glory is money — the investment of wealthy club backers. The fascinating behind-the-scenes documentary “The Four Year Plan,” for example, explores the investment by a group of billionaires into Queens Park Rangers, an attempt to elevate the team to the Premiership. Money can secure players, players can secure wins, and wins can secure promotion. And promotion means, well, money. A promotion or two away, we find the next levels of the pyramid. Levels 3 and 4 are known as Football League One and Football League Two. Football League One promotes three teams to the Football League Championship and relegates four to Football League Two, respectively. Football League Two promotes four to Football League One and relegates two out of the Football League altogether, to Level 5 of the pyramid. These leagues are not without their storied members. Football League One is currently the home of one of the most interesting teams in the history of the English football hierarchy — Milton Keynes Dons. Well, sort of. They weren’t always known as MK Dons. The Wimbledon Football Club was founded in 1889, in Wimbledon, in southwest London. A century later, it completed one of the most remarkable rises to prominence of any club ever. According to the Football Club History Database, Wimbledon spent most of the 20th century in the Isthmian League — currently Levels 7 and 8 on the pyramid. But it was promoted, and promoted, and promoted, and promoted again. It won the 1987-88 FA Cup and was a founding member of the Premier League in 1992. But who owns this history has been a subject of bitter controversy. In 2003, the team relocated to a new stadium, about 60 miles away in the town of Milton Keynes, taking the town’s name but retaining Wimbledon’s “Dons” nickname — and laying a claim to Wimbledon F.C.’s history and hardware. But there is another Dons club, which objects. AFC Wimbledon, based in southwest London, was formed in 2002 by fans dissatisfied with the move of their former home team. Currently, MK Dons play in Level 3, while AFC Wimbledon Dons play in Level 4. The two teams with the shared, messy heritage played in a Football League Cup game last month. MK Dons won, 3-1. The next seven levels of the pyramid (Levels 5 through 11) are referred to as the National League System. Anyone familiar with the details of, say, royal succession, might not be surprised to learn of the arcane nature of the depths of the English football pyramid. Anyone considering a certainly non-habit-forming alternative to Ambien might do well to peruse a guide to club structures of the English league system. The NCAA basketball tournament, of course, begins with 68 teams. The 2013-14 instance of the FA Cup began with 737. (Imagine March Madness with every Division I team, every Division II team and maybe some really good high school teams.) And a low-level team need not win the Cup to see a windfall. The FA awards 18,000 pounds even for a first-round win — a potentially huge boon to a club trying to climb the ladder or stay afloat. Teams in the lower regions of this group can also compete for other FA hardware, including the FA Trophy (open to Levels 5 through 8, with 50,000 pounds going to the winner) and the FA Vase (Levels 9 through 11, 25,000 pounds). In just these two relatively minor competitions, last year the FA awarded 1.6 million pounds, or about $2.7 million, in prize money. Believe it or not, we’re not through yet. Not even, like, close. Behold the “non-League” teams. By my calculations, from the ThePyramid’s information, there are 446 separate divisions hosting competition at Level 12 and below. And there are 5,510 teams! Depending on how many players low-tier teams keep on their rosters, there is something like 100,000 soccer players on teams in the pyramid. But the land of 32 million pound transfer fees this ain’t. The East Sussex Football League — Level 12, sponsored by ADA Turkish Barbecue & Meze Bar — charges a one pound fee for each player a team registers. Referees in this league earn 29 pounds a match. Unable, for some reason, to play in your normal team colors in this league? Sorry, that’ll be 20 pounds. What these teams lack in salary or facilities, they make up for in character, including their names, which are fantastic and undeniably English. A sample: Uphill Castle, Viney St. Swithins, the Kidlington Old Boys, the Victoria Baptists, the Didcot Casuals, Capel Plough, Quedgeley Wanderers, Kimberley Miners Welfare, Uffington United. When the 20 Premier League teams do battle this weekend, millions will watch. But thousands of other English football teams will do battle, too. And, for the most part, the pyramid will not be televised. Despite typically being referred in the States as the English Premier League, or EPL, certain Welsh teams are eligible to play in the Premier League. This year, there is just one — Swansea City. Another Welsh team, Cardiff City, was relegated last year. Note that the 1994 champions, Blackburn Rovers, currently play in the second-level Football League Championship. The lowest seed to win the NCAA tournament was eight-seed Villanova in 1985. The only “non-League” side to win the FA Cup was Tottenham Hotspur in 1901, playing then in the equivalent of the third tier of English football.